Well done! I dont think I have ever seen your stallion before so I went for a nosey. He is very nice! He's getting on now. I bred this youngster in case "Willy" went infertile! I think he is a best kept secret. You get as good hind end action from a Section D as you do from a lot of Warmbloods. That is fantastic, really well done. Well done. How many has he covered? Do you have Sammy Jo G with you? I worked on a stud when she arrived (from overseas if I remember rightly) and she had a smashing foal, she is a lovely broodmare. Congratulations! I was going to ask if this was the one you bred out of Sammy Jo G - we have a gelding out of her and he is a lovely boy. She obviously throws nice stock! Not many at all. Some are local and just used as nice all rounders, but capable of much more, as I've proved with my homebred mare who now has 37 BE points, despite being a small ponylike person. I'm afraid Sammy is no longer with us. i bought her at 17, specifically to put to my stallion who was also getting on in years. She really struggled to foal Garanwyn (he was her 10th foal), and I decided not to breed from her again, as I thought I might lose her foaling. She was unhappy once weaned, was lame behind, and her legs kept swelling up, so I made the decision to put her down before the winter hit. We are very wet here, and everything has to be stabled, and she wouldn't have coped with that. She left me a very nice legacy though. Who is yours by? Would love to see pictures of him. Was he bred in lincolnshire? that's where I bought her from. She was a dear mare who lived to be a mother. Sorry to hear about Sammy Yes our boy was bred in Lincolnshire and is by Take It 2 The Limit. He is five now, and my daughter has backed and schooled him herself. She has been away at uni for three years, so he hasn't done an awful lot yet but we are very pleased with him and hope he will be out eventing next spring. A couple of pictures below showing my daughter jumping him, and one of me riding him in the school. The second picture is testament to his lovely temperament because I am very careful what I get on these days! He is an incredibly handsome boy. Very nice! Interesting to see that he's chestnut, yet his full brother is bay with a lot of white. You know Sky is now retired from eventing and doing dressage in Ireland? I was in touch with his owner on FB, and she said he was the nicest horse she'd ever ridden. Not many of Sammy's foals have gone on to event, which is disappointing. 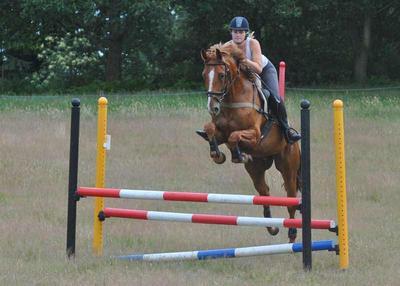 Your boy should do very well eventing! Yes, I know about Sky, I am in touch with the lady who has him now and she seems to adore him! 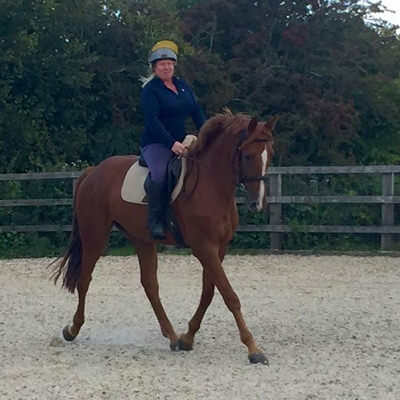 Apparently he is doing a bit of showing as well as dressage and was second in his Riding Horse Class at the Royal Dublin Show, plus he has qualified for the National Dressage Championships out there! Nice to know he can turn his hand to anything!